Foundation problems can lead to a number of different issues with your home. Fortunately, there is a solution to a sinking or failing foundation called “piering.” Piering, also known as underpinning, involves driving steel legs (or “piers”) underneath your foundation to act as supports. In most cases, it can raise your foundation to its original position. At the very least, it will secure your sinking foundation in place and assure it doesn’t drop any farther. If you suspect that you might need a foundation repair, then you may be wondering how much does foundation piering cost? In order to give you some sense of what to expect—and avoid getting ripped off—we’ve rounded up some helpful information on piering costs. First and foremost, there is no set price for piering as there are a number of factors that can impact the cost. But you should know that generally speaking, a pier typically starts around $1,000 apiece. The cost can go up from there. While it may seem expensive upfront, it’s also a permanent solution for a sinking foundation—a serious problem which could ultimately cost you even more in the long run. One factor that can raise the cost significantly is whether or not the steel piers are installed from inside of the home—which generally they can be. However, if it’s necessary to install from the outside, which will require major excavating, then that can add several thousand dollars to the project. Another factor that can greatly impact the cost is the type of pier being used. This is where some companies can be deceiving and wind up impacting the overall value of your piering solution. Let us provide some examples. A helical pier, also known as an “anchor” or a “pile,” is a foundation solution often used to secure a front porch. In this case the pier doesn’t need to hold a tremendous amount of weight. But, in an effort to charge you less and secure your job, some companies will try to use a helical pier on a main foundation despite the fact that it won’t go deep enough or get the friction that it needs to support your foundation. While it may seem like you’ve got a great deal, in the long-run you will be faced with problems. That’s because instead of being a final solution, you’ll be back to square one when the helical piers start to fail. 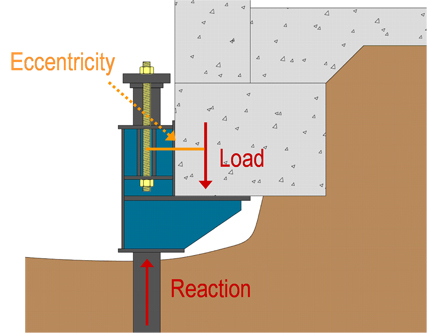 Another solution that may seem less costly at the onset are eccentrically loaded push piers. The problem with using these piers to support your foundation is that they push with a force upwards of 10,000 psi, which runs the risk of basically blowing out the foundation footings because it’s so powerful—something we’ve seen happen before. 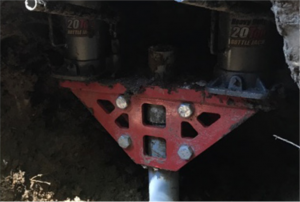 At Adams, we use a system with a bracketed pier that allows us to lift the home at only 4,000 to 5,000 psi, greatly reducing the probability of damage to your foundation. You know what they say—if it seems too good to be true, it probably is. That’s definitely the case when it comes to the cost of piering. We’ve already explained two ways that contractors might underbid their competition using a pier system that isn’t really suited to your foundation’s needs. Another way that they may come in with a low price is by installing fewer piers than needed. In most cases, piers need to be installed 5- to 6-feet on center (meaning no more than 5 or 6 feet from center to center of each pier). In some cases, it may be possible to go out to 7 feet in areas. But for the primary load, that 5- to 6-feet distance is key. Even so, some companies will put them on 8-feet centers, which means fewer piers and a lesser cost. They’ll get your business for a cheaper bid but when your foundation starts dropping again, they’ll fall back on your signed agreement, saying they’re not liable. The truth is, it’s worth paying a little bit more to get a solution which is truly permanent. In the end, like most things in life, when it comes to proper piering, you get what you pay for. Unfortunately, we’ve had to come in and correct jobs where piers have failed. More often than not, the company that did the original install work is nowhere to be found—maybe because they went out of business. That’s left the homeowner frustrated and facing more expenses. When it comes to the cost of piering, the goal is to work with a company that will only have to do the job once. By making a wise choice from the onset, you’ll get long-term value out of your investment and will gain the peace of mind that you won’t have expenses down the road.